Older CT scanners took a long time to acquire the images, because the table had to move the patient through the scanner in between the circular movement of the X-ray tube around the patient. This process was necessary because the power to the X-ray tube was provided by a large ribbon cable that had to be wound and unwound as the tube circled the patient within the gantry. This so called “step-and-shoot” method could take 30 minutes to acquire images of a patient’s chest. Spiral CT scanners have revolutionized the process of CT image acquisition. By relying on slip ring technology, the tube never needs to stop spinning around the patient. This allows the table movement to be continuous throughout the examination leading to much shorter scan times. The newest CT scanners also use multislice detectors allowing them to acquire more than one image with each rotation of the X-ray tube. 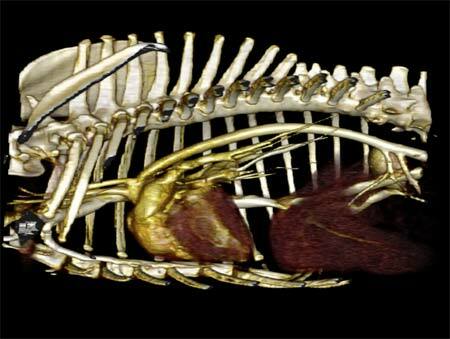 With AVMI’s new multislice GE spiral CT an entire chest study can be performed in a single 30 second breath hold. Not only does this reduce anesthesia time but dramatically improves image quality by preventing motion artifacts that often accompanied studies performed on slower scanners. According to Broome, “Not all CT scanners are the same. The best quality equipment is necessary to obtain the best diagnostic image. And the best diagnostic image is needed to ensure the most accurate diagnosis.” While competing veterinary facilities have purchased used older CT scanners, AVMI spared no expense by installing a new state-of-the-art multislice spiral CT scanner to ensure the best image quality and most accurate diagnosis.